Reception: Thursday, October 29, 6–8 p.m. The Department of Theatre and Visual Arts at Fordham University is pleased to present THE EVIL GENIUS OF A KING, a new project by Matthew Bakkom. This exhibition brings together fifty-two enlargements made from a deaccessioned art and art history slide collection from St. Cloud University in Minnesota. 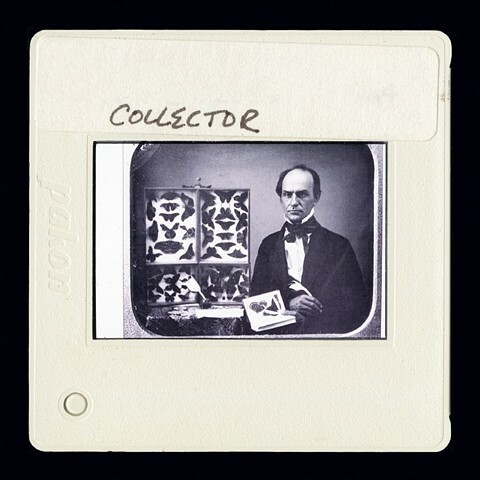 The artist was given this teaching collection—approximately ten thousand 35mm slides—and utilized the material to generate a survey through the history of art; however, a survey that entirely avoided traditional classification according to eras and movements, rather interpreting the collection based on chance juxtapositions and natural affinities. The 12.5” square images are installed in a continuous band that encircles the Lipani Gallery. Connections arise at times from linguistic puns between caption information on the slide mount, from formal relationships between images, and from associations between image content. THE EVIL GENIUS OF A KING is a subjective inquiry into the trajectory of art history, as well as homage to a now obsolete teaching technology. The shift from the first image in the exhibition, the boardroom of the Whitney Museum of art, to the second, the Tower of Babel, sets the tone for what is to follow. Across fifty-two slides, art historical notions pertaining to style, influence, and tradition are circumvented, yielding a visual narrative that is alternately critical, poignant, and at times quite humorous. Matthew Bakkom (B.1968) is an Assistant Professor at the University of Wisconsin-Madison.Since the early 1990's he has been active as an artist and organizer in the U.S. and Europe. His first book, New York City Museum of Complaint was published in 2009 by Steidl-Miles.